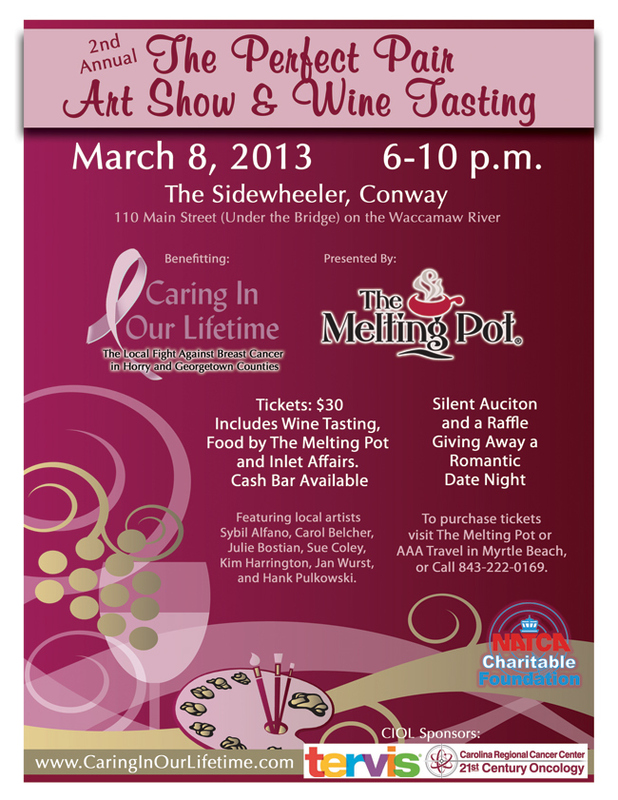 Caring In Our Lifetime, the local fight against breast cancer in Horry and Georgetown counties, is excited to partner with the National Air Traffic Controllers Association (NATCA) Charitable Foundation for “The Perfect Pair Art and Wine Tasting” to take place Friday, March 8, 2013, from 6-10 p.m. at the Sidewheeler in Conway, SC. Tickets are $30 per person. Admission includes wine tasting and food, with dessert provided by The Melting Pot. Tickets may be purchased in Myrtle Beach at The Melting Pot or AAA Travel, or by calling. A silent auction will be available, as well as a cash bar. Entertainment for the evening will be provided by steel drum musician, Dr. Tim Peterman. Art will be showcased by local artists. You can read more about the event on the flyer. Check out photos from last year's event on their Flickr page. And to keep up with the latest from Caring in Our Lifetime, like their Facebook page.